Got up before seven with plenty of time to go over my gear. Made myself some eggs and put on coffee, enough for Jaimie, Jonathan, Aaron and Kira who have yet to make their way down. Humming birds were zigzagging around the open garden when we said our good byes with Nicole, the co-owner and director of the reserve. Christian, a local man who helps maintain the property was also there to see us off. Wilo, Nicole’s partner, gave us a drive to the milk station where we waited for the cargo truck to make its daily milk run. A local driver, Tadeo, showed up around 9 30 am making the pickup with his own 4×4 pickup truck since the cargo truck still had a broken axel from a week ago. After shaking hands with Wilo I climbed in the back of the 4×4. On the way to Las Tolas the car filled up to the brim with people and milk jugs. Jonathan and I ended up sitting on the roof holding on to the milk jugs behind us. We were overcapacity from the start as the car stretched, dove and climbed over basketball size pot holes and stream beds in in the mountain road. It was a fun way to see an integral extraction process (milk production) to the area. From Tulipe we caught a free ride on a transport truck which happened by as we arrived. The driver swung open the heavy metal doors in the back and we claimed in without a second thought amongst husks of leftover corn. For about 20 minutes we only saw the outside through small holes and slits in the canopy structure as the truck sped across the road. In La Amenia the doors swung open. Everyone else except for me was going west, so when a bus heading in that direction pulled up as we were walking towards the stop, everyone ran off yelling their goodbyes. And just as quickly as we have met, we separated just the same. I didn’t even have a chance to pay back $2 to Jonathan for the ride with Tadeo. The bus stop was a bench with a roof next to a gravel patch that separated it from the main two lane road. The view was of a hillside with a dirt road reaching upwards. A pretty mother sat beside me with her daughter. She had a face I could fall in love with. I smiled at the daughter who took an interest in me, asking her mom questions about me while hiding in between her legs. From one of the busses that stopped briefly a vendor got off and walked over to our long bench sitting on my other side, placing two awkward packages of snacks he was selling next to him. A friend of his came over and they chatted, taking a brief interest in where I was going. Buses came and went for over an hour and my sense of urgency slacked. Then suddenly a bus came, MY BUS! I would have missed it if the vendor hadn’t alarmed me in time. I chased it down and got on without putting my bag pack in the cargo. Sitting by the door I had space for my bag to lean against me. People got off and on randomly along the way eventually filling up the bus with a few standing in the isle. Village after village the time passed as I kept present and aware of the landscape, largely made up of banana fields. I didn’t have a clue about the time and distance involved in this leg of the trip, so it was best to be present in the moment and not try to anticipate when and where I should be. After about two hours we pulled into a bus terminal where I was told that it was still another 30 min to San Domingo where I thought I was to transfer to my next bus. Something got me to talk to the assistant again, explaining that my ultimate destination was Piedronales. He then took me off the bus and led me to a small office in the terminal where I got my next ticket for the bus that would take me where I need to go. Sitting at the terminal for over an hour I watched a group of the vendors hustle their goods to each coming bus, sometimes pushing each other out of the way. It was a competitive scene and one I have seen all over South America. It’s a class of people off all ages, sizes and genders selling anything and everything one can carry in multiples. It is a rough way to make a living having to spend most of your day carrying awkward packages, moving from place to place, bus to bus in the heat, dust and traffic congested streets. In contrast two man were playing a game where a 50c coin was tossed towards a crack in the pavement. It seemed that the coin closest to the line meant winning. An hour went and neither seemed ahead, but everyone around was animated by the competition. It felt like they have been playing this game since they were little and the only thing that has changed is their physical stature, each toss filling up a few more moments of a life. The bus finally arrived. I am not sure if it was the hunger, or the duration of the trip or the altitude drop but I had a headache. Once in motion it was impossible to read or write because of the shifting, swaying and vibrating bus, but there was plenty to look at. What really impressed me on this leg were the hills, empty of trees with only a few palms scattered here and there. I was trying to imagine the jungle that was once there teaming with life before it was reduced to grass. I got to Piedronales around 7pm. No one in any of the offices knew anything about a bus to Canoa. By now Ecuador felt very much a rural country, not unlike parts of Ontario I biked through with stretches of farmlands in-between small towns. The bus terminal was a shabby concreate building with a wall circling a dirt floor yard, resembling some of the junkyards I have been too. Cellphone technology allowed a leap in access to the world but the world still largely feels and looks unsophisticated. There is something strange in how the modern gadgets and plastic advertisements adorn unimaginative utilitarian concreate shapes aged by the environment. It’s something one sees all over the world. This clash of now with before. A consumerist flood of junk displacing local fashions, producers, cultures…when is this bus getting here? There were six ticket offices, four of which were open. No one knew anything about a bus to Canoa, the office for that bus line was a 200 square foot rectangle with a desk, some seats and a broken light bulb. The ticket person was absent. I went and bought a meat pancake to eat hoping the bus would arrive eventually, the sun was going down and a couple of local sketch heads were twitching about the place. When a bus did arrive, that seemed to be the one to take me to Canoa, a driver got out and started talking excitingly with someone that seemed to be a ticket agent. He then got on a phone, from what I understood no one knew who was to charge for collecting the money for the ride. After 30 minutes he opened the doors and told everyone to get in. When we got going around 10pm, his assistant came around and collected money from everyone based on where they were going. One needs cash when traveling in South America. Getting into Canoa I was hungry, fatigued and sweaty. It took me some time to figure out where the hostel Pais Libre was. I emailed them about a room two weeks before. It turned out they didn’t have a space for me after all. Slightly puffed I made my way down to find Jana, a friend who runs a surfing school here and my main reason for stopping by. Looking for her I found El Jardin, so after saying hello to her and her partner I went back and got a room! I settled in on one of the four bunks in the room, luckily mine had a mosquito net! The upper bunks were occupied by women who seemed like they just finished parting moments before and passed out before their heads rested on the pillow. Parts of their contorted bodies stuck out from under thin sheets, one was snoring. On a suggestion from Sasha, the girl working there for room and board, I went down for a swim. 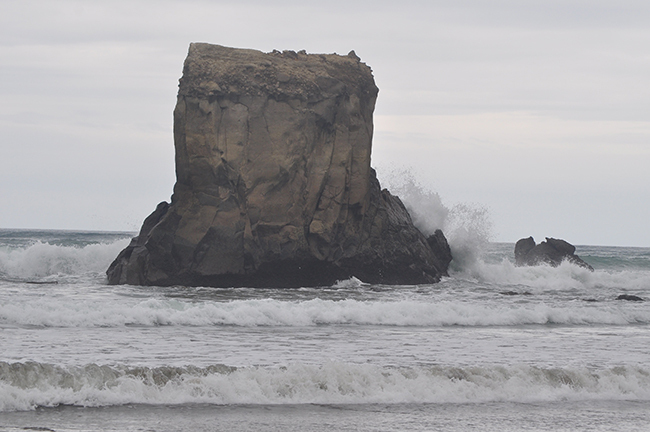 Only foam was visible in the darkness as I walked into the Ocean and it healed all things. One of the key responsibilities of a volunteer at Un poco del Chocó is the maintenance of trails which meander fluidly through the terrain. Unlike roads, they do not divide land in such a way as to prevent certain animals or birds from crossing over them, since certain species avoid open areas due to fear of predators, leading to habitat fragmentation. The jungle being a dynamic system of life-death-decay-rebirth creates and sheds life matter at an impressive rate. There is always a demand for raking and trimming of foliage on the trails in order to minimize the risk of stepping on a snake, slipping or tripping. 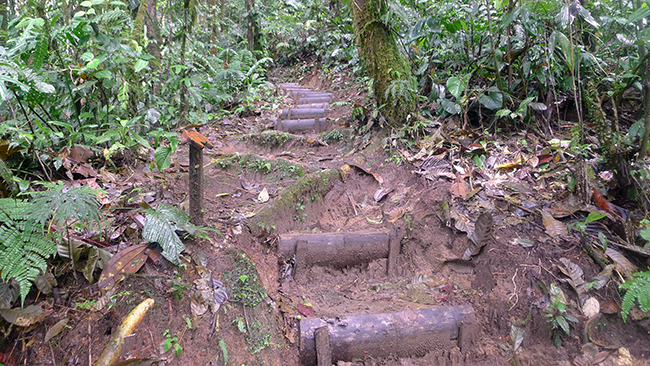 The more physical tasks involve building and repairing stairs as well as cutting and removing trees and bamboo that happen to fall onto the trail. In case of occasional landslides there is digging, moving dirt and struggling with gooey to rock hard clay. A section of a trail collapsed onto a lower section. 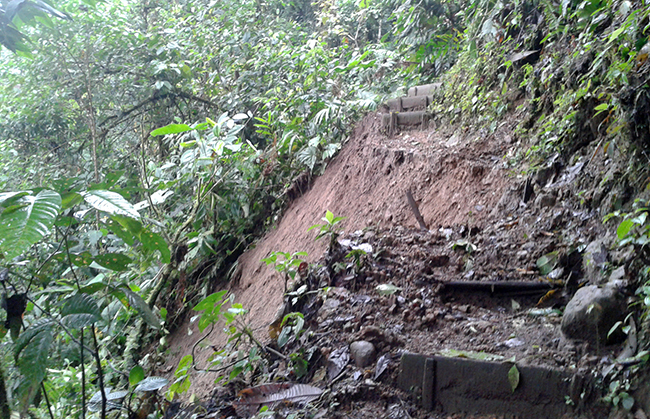 Landslides are relatively common during the rain season. 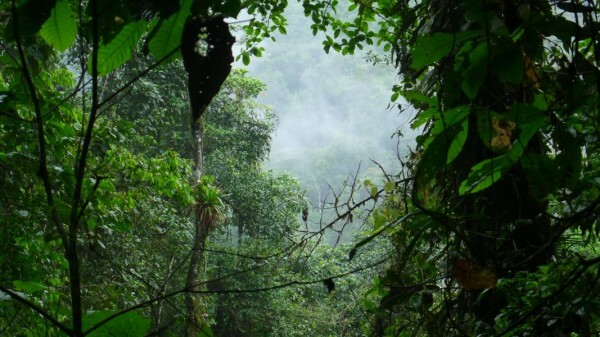 The 15 hectare biological reserve is “in the transition zone between two biodiversity-hotspots, the Chocó and the Tropical Andes” (unpocodelchoco.com). Five kilometers of trails cover a portion leaving most of it to the fauna and flora, undisturbed by humans. This piece of paradise is located on a side of a ravine with the base camp at 1200m and the Pachijal River acting as a boarder 250 meters below. The yellow trail weaves for half a kilometre almost directly down before abruptly turning towards the base, once reaching the river. An average walk up takes about 45 minutes. “Racing” could shave it down to a breathless and near fainting 15 minutes, after a few weeks of trail walking. The other three trails zigzag lengthwise along the side of the valley, each with its own character. The difference of elevation allows for access to various levels of the canopy, a key feature of the area. I had the opportunity to observe birds and plants that otherwise would be invisible up high in the dense foliage of the cloud forest. Hundreds of stairs snake around trees, down steep slopes and over roots with a gentle, sculptural presence. A braced piece of wood with packed clay forms each step ranging roughly between 12cm (6”) and 30cm (12”) in height. Palm wood is used here do to its ability to withstand rot (up to 10 years as opposed to the average of 3 months for other tree species). Building or repairing stairs is a challenging physical task. First, the 1 meter (3’) long palm pieces are brought down to where they are needed 1-3 pieces at a time, each weighing about 10kg (20 pounds). After splitting certain pieces to make spikes on site, a hoe is used to dig out a straight line into the earth. A piece of palm is then placed on the line with two spikes bracing it from the front. Clay fills the gaps, rammed with a piece of flat wood to compact it. There was something to discover with every walk through the jungle. Bamboo shoots ruptured silently through the earth and orchid flowers hung heavy with water. Dozens of types of insects and birds filled the forest with sounds. Trespassing on an adjacent valley farm to paint the opposite side, I listened to a cicada begin its call. The next one fallowed with in a second, so did the third, forth,… by now the first finishing. And so it went, a shimmering suggestion of a wave that appeared at the edge of perception became a sound tsunami as it passed my area, moving well past the other edge through the valley like a human wave in a stadium. The warm air seemed to vibrate with the sound of the cicada. 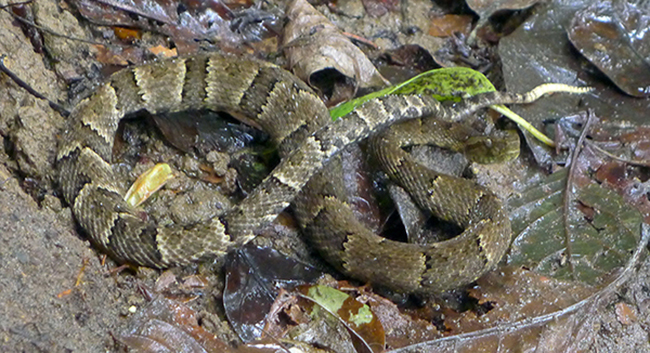 During a clandestine evening, walking the trails in a heavy downpour Bothrops punctatus, a sister of the very dangerous fer-de-lance (Bothrops asper) slipped down in front of me to our mutual surprise. She coiled with raddle shaking, looking straight into my eyes. Grateful for the warning I took a step back, crouched and took a photo. Paying attention not to slip or make sudden movements I admired her stone mosaic like skin while she slid away in the opposite direction. A week later, on the green trail, a small leathery black and yellow snake darted out of nowhere towards me lunching into the air. Moving to the side just in time for it to fly by my legs I watched it disappear into the bush letting the adrenaline flow through my body, big smile on my face. On my way for a swim, walking around a large mahogany tree I surprised a group of Rufous-fronted wood quails. The group split in two opposite directions leaving one thoroughly confused as to which way to run. It was a great opportunity to have a good look at him, its red breast plumage seemed to shimmer amongst the warm greens of the jungle. Its’ confusion, as it paced this way and that was amusing and it took him a good thirty seconds to make up its mind as to which way to run. Bothriopsis punctata is a venomous pitviper species found in South America and Panama. There was nothing unusual about the flight from Toronto to Quito. For a few minutes in line at U.S. Customs I thought I might not make my flight as the line was huge and my flight was leaving in less then an hour. I landed in Quito 12 hrs later. Got into my Hostel at 2 am and crashed. Did not realize it then but the altitude in Quito, combined with jetlag and the flue I have yet to fully recover from left little energy in me. After breakfast I got out my travel itinerary that had details and broad strokes about different sections of my 80-day research trip. Found myself staring at the page section that only had the name of the place I was going to without any other details. The longer I stared the more anxious I began to feel, thinking that somehow the details would fill themselves in. Next came the questions: do I have enough money, is my Spanish good enough, what bus do I need to get to the terminal… In my tired state I was forgetting that that section of the trip was left undefined for a reason. I closed the itinerary, took a deep breath. This was something to be resolved later as other pieces of the trip would unfold. I had more pressing concerns now, like buying a new hat since I left mine on the plane, dammit. Getting to “Un poco del Chocó” biological reserve took about 4hrs from Quito. 30 min on local transit across the sprawling city, 2hrs on a regional bus and 45min in a 4×4 on the one road that gets to the reserve. A road that become important to me later on. The reserve is located in the Chocó region of Ecuador and is situated between 950 and 1200 meters above the sea level. It protects a small part of the ecosystem that once covered most of the region. It is a biological hotspot, with a great biodiversity that is in danger of disappearing; 83% of forests in Ecuador have been cut down since the 40s. My goal was to observe and learn from the researchers about how biodiversity is studied and understood. Parallel, I conducted my own observations, made watercolour studies and took photos of what interested me. Five days into the experience, I hit a wall. With so much stimulus I was having a hard time fitting the pieces with my initial idea for the work that would address the loss of biodiversity. Working with watercolours has proven to be a lot harder than originally expected. 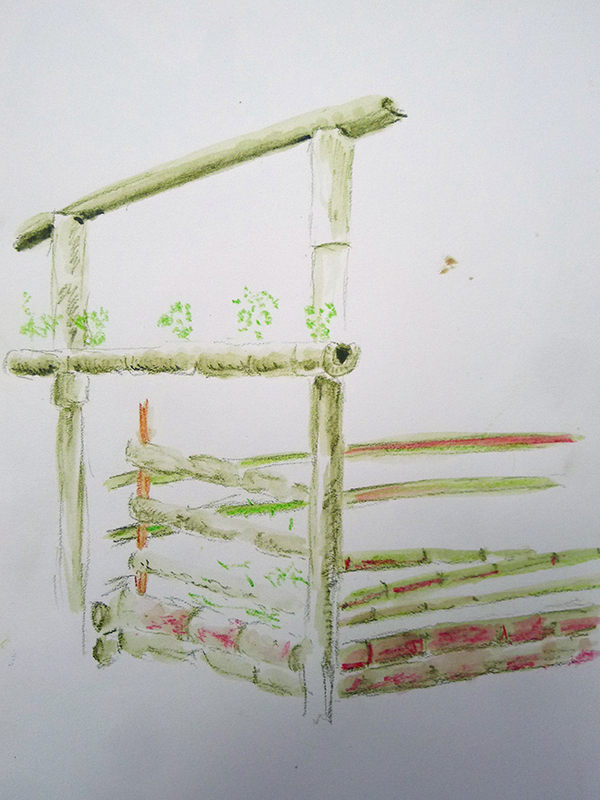 The humidity changed the watercolour pencils making them gummy, things took much longer to dry and regular rain and bugs made a lot of the locations I became interested in difficult or impossible to paint in. Then my camera stopped working do to moisture. In order not to focus on the negative I focused on what I still could do. Every weekday I worked for the first half of the day helping to maintain the reserve, learning about different plants and ways of working with bamboo or palms. Walking the 5 km of the reserve trails had multiple benefits. They gave access to different levels of the tree canopy, waterfalls, areas of secondary succession and the river.With every walk there was a new discovery and things seen before could be seen during different parts of the day in a new light. The second thing that provided me with a lot if interesting information’s and way of looking at things were the conversations with the student researchers. I was lucky to have arrived when two were just completing their research and another two were arriving to start. Each had their own uniqe perspectives and experiences to share. On the second weekend, Jonathan, one of the new arrivals was going to walk to Las Tolas. It is the nearest village, about 12km up the road and it’s about 700 meters higher then the reserve. Up to that point I did not give much consideration to the road as it was outside the reserve. Wanting to break the routine and see more of the area I went along with him and another researcher, Jaimie. They were both starting their research related to different bird species. The walk proved a crucial experience on my way to figuring out how to fit the pieces of what I was experiencing. It was my first sunny day there as it rained for the most part in the weeks prior. I found interesting locations to paint in without the aforementioned problems and the road gave me a much broader perspective on the surrounding area. Jonathan also volunteered to take photos on his phone for me during the walk adding to my already fruitful day. Change is one of the key associations I have when it comes to fluidity and it is something I have struggled with somewhat conceptually in finding a way to incorporate it into my work. After all, the most dramatic change occurs during the process of making the work, once finished the process retards. With each series of works I found a different way of framing change for myself in order to overcome this conceptual dilemma. In Fluidity: Actual Entities & Occasions of Experience, the show I am currently finishing working on, I am most satisfied with how change is incorporated thanks to the way the work is displayed. Each piece is supported on five individual stands custom built for the work. The individual supports allow for an endless set of possibilities in how the work is positioned altering its structure and how the work is experienced each time. 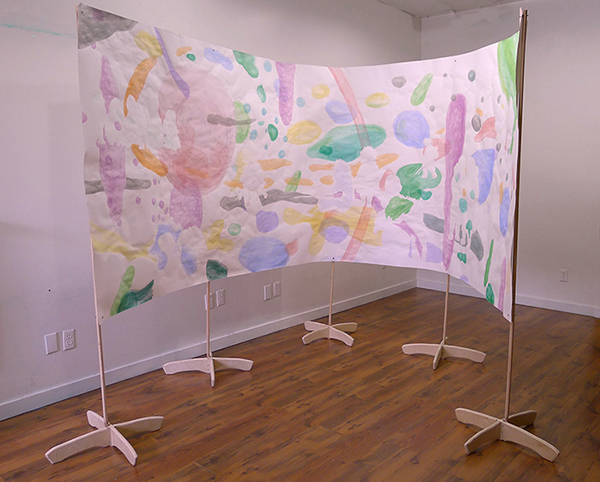 I built two different sets of prototypes in order to experiment with transforming the two dimensional works on paper into a three dimensional structure. The first prototype was unstable and bulky but it proved that the paper could be supported with magnets alone while interacting with a three dimensional space. The second, and much lighter prototype, added an element of motion to the work do to the elasticity of the poles. It is also a lot more stable do to a wider base. Now the movement of air inside a space can activate the work and in case that the flow becomes dramatic the elasticity of the poles will help to absorb some of the force of without helping to tip the structure over. I am really excited about the opportunity of installing all twelve pieces this way at Joseph D. Carrier Art Gallery this September and setting up a river like flow in what is already a really interesting, half rotunda, space.